Chelle you seem to be refering to analogies that have been constructed to make an otherwise practically not understandable process graspable. Yet without the underlying physics (math), which most of us do not understand (myself included), they are wothless and quickly lead to wrong conclusions. We can either stick to commonly used terminology or create our own. I see no problem with either except if you make your own without giving out appropriate definitions. So if you describe us what a particle vapor is and how does combusted particle look like I think we can eventually continue. Or we can agree on returning to traditional terminology. I'm sorry but your argument has no basis in reality....I've been an avid science fiction reader for many years and not even in that field has anyone come up with theories as wild as your decomposition ideas. I'm not going to continue arguing this as I can't follow the logic? involved at all. I think this lik was only added to show that there are self maintainiong or even self starting processes in nature, the example referrs only to such processes on chemial/biological basis, the connection to our problem here is only the analogy and the possibility that such selfmaintainnig processes are also known on nuclear basis (fission and fusion) and might be even possible somehow on particle basis, thats all. If you never came ocross somthing like this in fiktion you at least missed to read an important book of Isac Asimov where a technical device (think it was some kind of bomb) turned the whole earth into an unihabitable place by a chainreaction of somthing in the earths crust or athmosphere (unfortunately its alredy long since I read this book). About the vapor created by particle collissions there is really the problem of missing definition of a possible vapor, sins vapor commonly are molecules or atoms of ordinary matter in a gaseous state and it doesn't make sence to asume something like this for a particle collission. Even if we consider a particlegas like the QuarkGluonPlasma a vapor there is no expaination why alarge amont of this stuff exeeding the energy/mass of the initial particles collided should be created. Also the vapors created by the impact of a meteorite do not exeed the energy of the initial metiorite. I really don't see any point in this debate. I LOVE a good argument/discussion but this stuff absolutely lacks logic. It is pseudoscience without the slightest hint of any real scientific evidence. It is dribble. I would rather argue with a flat earth devotee. The kindest thing you can say to these people is "Get Therapy". Definitely my last post on this subject. chriwi wrote: About the vapor created by particle collisions there is really the problem of missing definition of a possible vapor, sins vapor commonly are molecules or atoms of ordinary matter in a gaseous state and it doesn't make sense to assume something like this for a particle collision. Even if we consider a particlegas like the QuarkGluonPlasma a vapor there is no explanation why a large amount of this stuff exceeding the energy/mass of the initial particles collided should be created. Also the vapors created by the impact of a meteorite do not exceed the energy of the initial meteorite. Also correct, and if I may like "Kasuha" suggested, keep on using my own created terminology, and ad a sketch with some scribbles to illustrate a how possible combustion process may work, by using the analogy of a domino effect. I know I'm taking a trip into SFantasy land because I do not now what is technically possible or not, but I guess if I'm going too bananas you boys and girls will discipline me. Proton-beams with a distance of 7,48 m between them, and a speed of 299792455 m/s give rise to about 600 millions collision/s, causing particle jets that spray the surrounding area with high-energies (link). I was thinking that event is a bit the same has what happens during laser-cooling where atoms loose momentum and cool down (or reversibly heat up?). 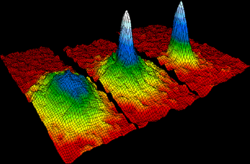 Depending on the type of atoms at these low temperatures the atoms convert into Bose-Einstein Condensate or Fermi-Gas. When the atoms convert into BEC they end up becoming vapor, with peaks of concentrated bosons who can occupy the same place, but do not disappear. 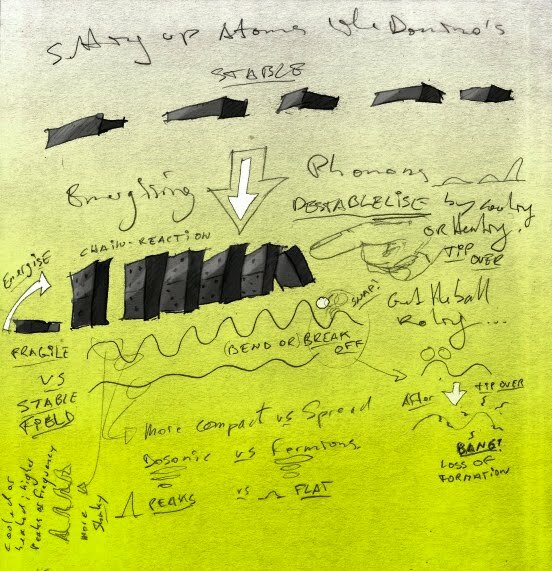 In my Domino-analogy I would like to refer to this as setting Up the atoms, becoming either more energetic, having a higher frequency, or more stiff and being more breakable, or more loose and becoming more flexible, in all of these case the atom loses it's basic natural form and possible stability. Thus the atom field of the area that surrounds the collisions become more peaky. So at one point in time the tops of these peaks may start to be broken of and cause the tipping over of the surrounding energized or (nearly) frozen atoms. Once the top of an atom is gone, its configuration is no longer the same and the atom as such can no longer exist and explodes or vaporizes into … causing a domino effect, or decomposition of matter. If you take two permanent magnets and hold them together with same poles facing each other, then you release your grip, they will "explode" pretty much the same way. No chain reaction involved. - to erect your dominos you need to implement careful procedure in which you must watch the dominos you have ready to not make them fall too early. This is not natural process - in nature, for each domino erected, two will fall down. This process is called entropy increase (it happens too when you erect your dominos, it's just the ones that fall are not ones you are interested in). - the energy released by your domino chain is equal to energy used to erect it. In the most fantastic case, all you can get in LHC is the whole energy of the beam. It's very high for particle physics but it's still quite low on human scale. The worst damage you can actually do with it is equal to a truck crashing to a wall. Correct, its a simple discharge. Correct, but you are setting them Up to the brink of destruction by energising / cooling them. Kasuha wrote: - to erect your dominos you need to implement careful procedure in which you must watch the dominos you have ready to not make them fall too early. True, but once you get going, there is no stopping at this level. Just like collisions of this type don't happen naturally within our atmosphere, at this frequency, in one particular spot. Kasuha wrote: ... for each domino erected, two will fall down. This process is called entropy increase (it happens too when you erect your dominos, it's just the ones that fall are not ones you are interested in). Not necessarily: "Physicists knew that at atomic scales over very short periods of time, statistical mechanics is pushed beyond its limit, and the second law does not apply. Put another way, situations that break the second law become much more probable." Second law of thermodynamics "broken"
Kasuha wrote: - the energy released by your domino chain is equal to energy used to erect it. In the most fantastic case, all you can get in LHC is the whole energy of the beam. Not in a cascading chain-reaction where energy release could be exponential. Kasuha wrote: It's very high for particle physics but it's still quite low on human scale. The worst damage you can actually do with it is equal to a truck crashing to a wall. This is not relevant, once the event is started it simply goes. It's like saying the sparks that start of the engine of your car won't get you anywhere. Chelle wrote: True, but once you get going, there is no stopping at this level. Wrong, it stops with the last domino. Chelle wrote: Not necessarily: "Physicists knew that at atomic scales over very short periods of time, statistical mechanics is pushed beyond its limit, and the second law does not apply. Put another way, situations that break the second law become much more probable." Second law of thermodynamics "broken"
Okay so for every domino you erect just one domino falls. But you still cannot erect one without another falling. And it still only applies on individual particle level. Chelle wrote: Not in a cascading chain-reaction where energy release could be exponential. You still only have the dominos you erected. Chelle wrote: This is not relevant, once the event is started it simply goes. It's like saying the sparks that start of the engine of your car won't get you anywhere. LHC is not made from plutonium, there is nothing 'primed' for explosion in it and no significant amount of matter will become during all of its lifetime. There's nothing where your domino effect can take place. The only energy available to cause problems is the energy stored in beam and magnets. Although it's impressive amount of energy, it's definitely not going to destroy anything bigger than LHC itself (in the worst case). Kasuha wrote: Okay so for every domino you erect just one domino falls. But you still cannot erect one without another falling. And it still only applies on individual particle level. Not necessarily, if you can brake of a small part of a condensed atom, the atom cannot reform and will explode, cooling surrounding atoms, who would also get a piece broken off. One could cool plenty that would be the key. If you break a part of an atom, the atom will not explode as this requires an input of energy. If it did explode, it would not cool surrounding atoms, it would inject energy thus heating them. Can anyone explain what is a high-energy collision? I mean, we know that the LHC accelerates lead nuclei almost to the speed of light, and at the same time CERN says the current collision record is 7 TeV. So how can it be that with the same speed of lead nuclei scientists want to reach the next goal of 14 TeV collision energy? That is going to be twice bigger value, but the speed of lead nuclei will not be doubled (speed of light is the limit). I mean, we know that the LHC accelerates lead nuclei almost to the speed of light, and at the same time CERN says the current collision record is 7 TeV. The 7 TeV is for protons!! So how can it be that with the same speed of lead nuclei scientists want to reach the next goal of 14 TeV collision energy? The 14 TeV u mentioned above is the final goal for proton collisions. At that energy the protons will be even slightly faster (but still not reach c) and a lot heavier. Edge wrote: That is going to be twice bigger value, but the speed of lead nuclei will not be doubled (speed of light is the limit). When two cars collide, their speed is not the only important factor - the other is their mass. Together they give the car kinetic energy which is transformed to heat during the collision while generating collision debris. With particles it's similar - you cannot exceed speed of light but you can accelerate them (theoretically) indefinitely, storing infinite amount of kinetic energy in them. What does not add to the particle speed is transformed to the particle mass, high energy particles are becoming heavier (and thus harder to keep them orbiting in the ring). During collision, all of this energy is again used in generating collision debris. In lead nuclei collision, even lower "per-particle" energy is planned than in proton-proton collisions. Such a collision is like if one hundred cars collided with another hundred cars going in opposite direction - it will create huge mess but the energy of each collision will be equal to colliding just one car with another. Lead nuclei collisions are planned for studying of quark-gluon plasma behavior rather than for discovery of new particles. It depends on when you read it the first time. Was it after or before the new LSAG report? I noticed that they add from time to time arguments at the bottom of the page.